Did you have an awesome Valentine's Day? I did! I had a date with my hubby and 2 babies for some Mexican food, it was perfect! 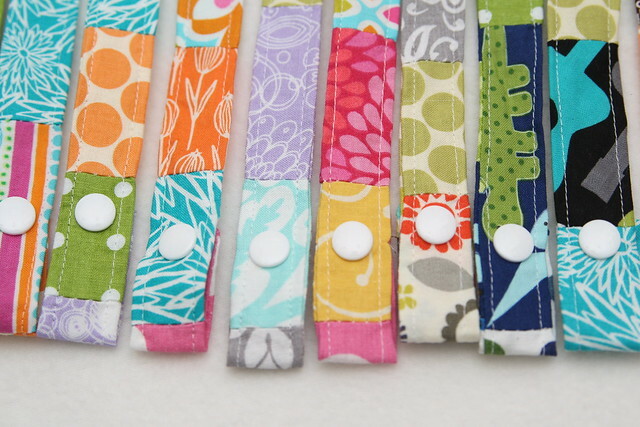 I am excited to share these pacifier clips with you today! 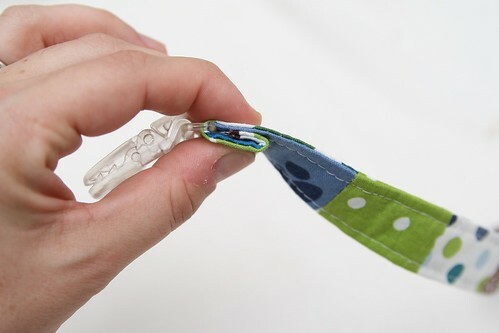 Pacifier clips are so simple to make and save you from constantly fetching pacifiers off the ground. They are a must have for any new mom. If you can believe it, I had somehow forgotten about these handy little things between the time my son stopped dropping his pacifier constantly and the time my daughter was born. We were about to head out for a day trip to Disney World (one of the perks of being a Florida resident...spontaneous day trips to see Mickey!) and was packing several pacifiers for E. Then I realized if I had a paci clip I wouldn't need to take 5 pacifiers! I already had the clips and snaps and I figured it would be quicker to make one then try to remember where I had packed A's clips away. (My husband thought I was nuts when he found me sewing in the back room before we left...what's new). 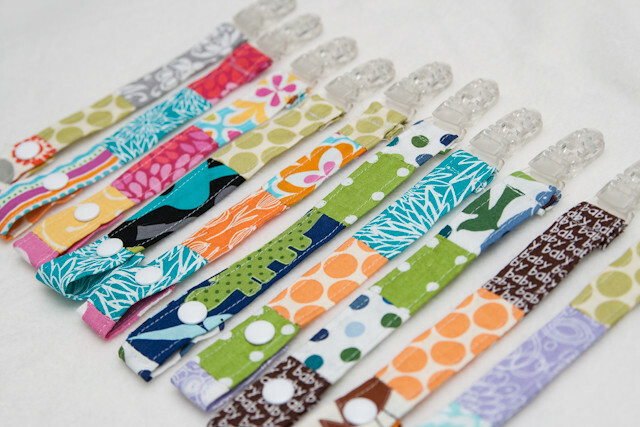 I grabbed some fabric scraps and 10 minutes later I had a paci clip - and we had no dropped pacifiers all day! 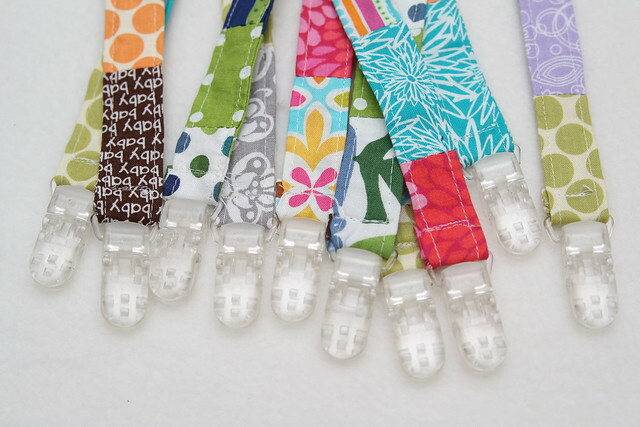 I like these plastic clips (I buy them from kamsnaps.com) but you can get metal suspender clips at any fabric store, they work too. 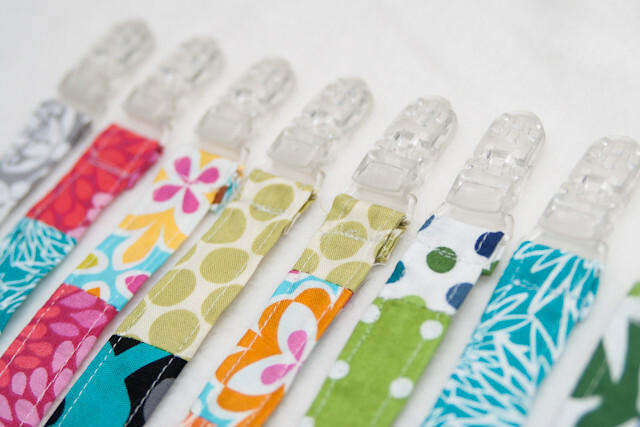 Just snap on the pacifier and clip it to your baby or your stroller and you are ready to go! 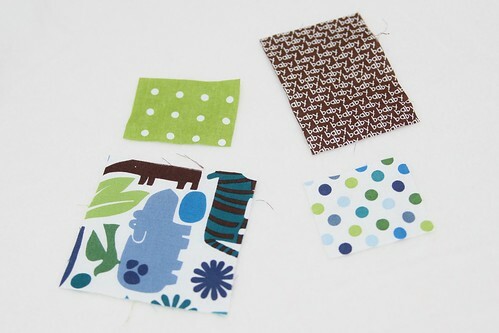 These scrappy style ones are a great way to use up fabric scraps, even tiny little scraps, and they are so colorful. 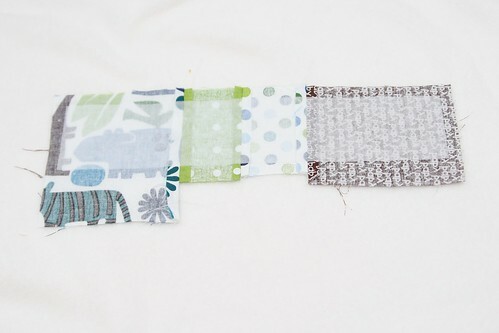 coordinating fabric scraps, cottons work best. 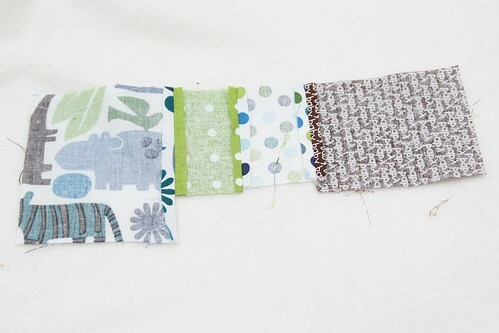 Pick out your fabric scraps, I used 4 fabrics for most of mine and I cut them so they were between 2" and 4" long and they need to be at least 2.5" wide. Sew them all together and press the seams open. 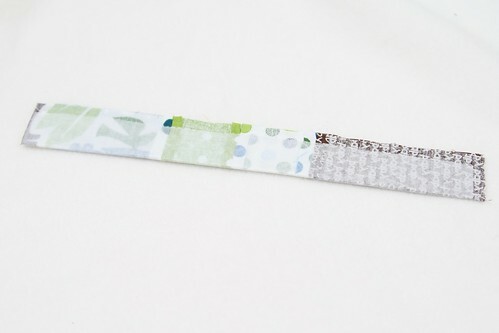 Iron your interfacing in the middle. 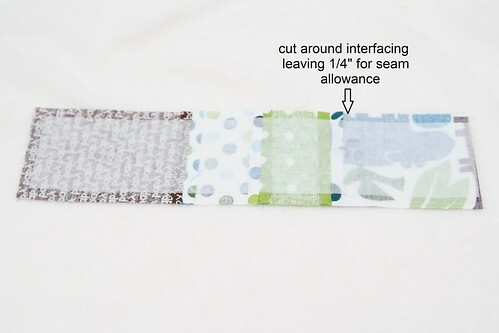 Cut around your interfacing, leaving 1/4" on three sides for seam allowance, the forth side you can cut right along the interfacing. 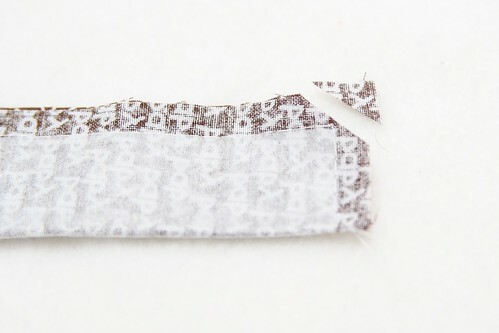 Fold your rectangle in half long ways and sew along the side and bottom, you want to try to sew right along the edge of the interfacing. Clip the corner close to the seam, make sure you don't clip the stitches! Turn right side out and press, top stitch around the sides and bottom. 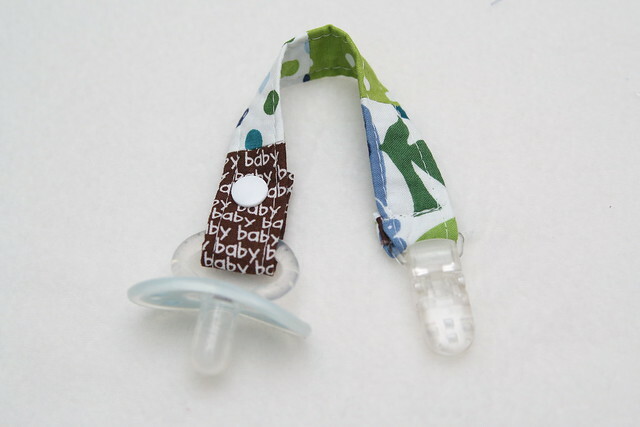 Thread the top through your paci clip. Fold it twice so the raw edge in hidden inside. Sew back and forth a few times where it is folded over. 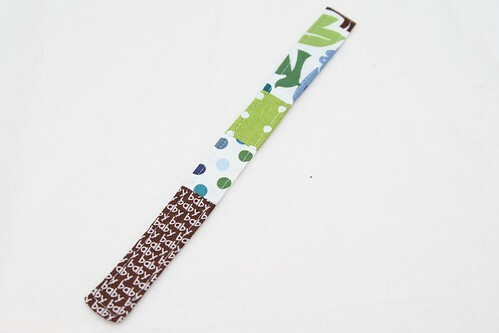 Then add your snap or velcro to the bottom and you've got yourself a paci clip!